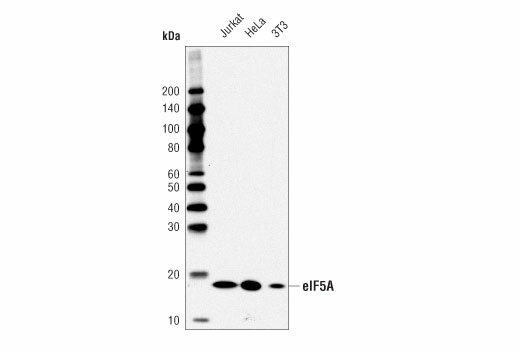 Western blot analysis of extracts from Jurkat, HeLa, and 3T3 cells using eIF5A (D8L8Q) Rabbit mAb. eIF5A (D8L8Q) Rabbit mAb recognizes endogenous levels of total eIF5A protein. Monoclonal antibody is produced by immunizing animals with a synthetic peptide corresponding to residues surrounding Asp104 of human eIF5A protein. Eukaryotic initiation factor 5A (eIF5A) is an mRNA-binding protein that is involved in translation elongation and plays an important role in promoting translation of polyproline motifs (1-4). The eIF5A (eIF5A1) and eIF5A2 genes encode the two vertebrate eIF5A isoforms. While eIF5A1 is expressed constitutively in all tissues, eIF5A2 is mainly expressed in gonads. eIF5A and eIF5A2 are the only identified proteins that contain the distinctive amino acid hypusine, which is generated posttranslationally from lysine through a highly conserved polyamine metabolism pathway. eIF5A function and hypusine modification are both essential for cell proliferation, as knock down of eIF5A expression or blocking eIF5A hypusine modification suppresses cancer cell proliferation (5-7). Interestingly, eIF5A is an identified component of a tumor suppressor network of the polyamine-hypusine axis. Co-suppression of both eIF5A and adenosylmethionine decarboxylase 1 (AMD1) promotes lymphomagenesis in mice, while heterozygous deletions of the corresponding AMD1 and eIF5A genes often occur together in human lymphomas (8). Saini, P. et al. (2009) Nature 459, 118-21. Ude, S. et al. (2013) Science 339, 82-5. Doerfel, L.K. et al. (2013) Science 339, 85-8. Gutierrez, E. et al. (2013) Mol Cell 51, 35-45. Wolff, E.C. et al. (2007) Amino Acids 33, 341-50. Park, M.H. et al. (2010) Amino Acids 38, 491-500. Mémin, E. et al. (2014) Cancer Res 74, 552-62. Scuoppo, C. et al. (2012) Nature 487, 244-8.